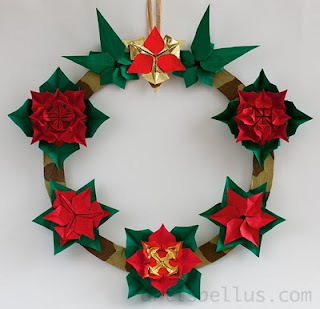 Wreaths are wonderful decorative elements for Christmas. 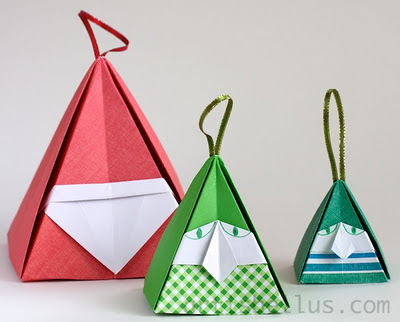 They can be hung on doors, windows or walls around the house. Poinsettias are also part of the Holiday traditions. 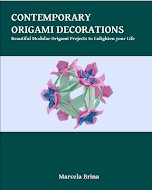 All the poinsettia-like flowers decorating the wreath were designed by me. 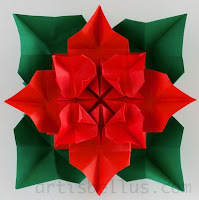 The poinsettia in the picture below is folded from three square modules and no glue is required to assemble it. You can find the diagram here. Please leave me a comment and tell me which poinsettia model you like the most. Lovely poinsettias! I'll definitely try the one you posted diagram for. It looks really great and I also like the one in the upper left part that looks almost the same. Fabulous poinsettias! My favorite one is at the 4 O'clock position. Beautiful flowers! My favorite is also the one at 4:00 o'clock. Thank you for sharing. I love the poinsettias. I like the first one. My favourite would also be the one at 4 o'clock, and the one at 8 o'clock comes as second. While the curly model is very pretty, the shape isn't what I associate with that specific flower. I love the version you posted the diagram for. was looking for a wreath to make. I'll try it tonight! thank you! Great Christmas Wreath New Poinsettia Model. Really I like it. It is good for Holidays. Beautiful Christmas wreath! New poinsettia model is so fantastic.